So… Where do I begin? To be honest, I didn’t even know you could rupture your achilles tendon until it happened to me. I had never heard of the injury before and I didn’t even know it was possible. Even when it happened, I had no clue what I had done. I assumed I just twisted my ankle or pulled a muscle in my calf- I truly had no idea what I was in for! It happened on May 23rd (a month ago now) while playing coed soccer. To give you a bit of background information- I am an avid soccer player and I have been playing 4x week for about 5 years now (with no serious injuries). I am in pretty good shape as I do stay very active, and like I said I have never seriously injured myself before. I have sprained my right ankle a few times and I have a hematoma in my right shin but nothing crazy. Anyways- there I was, mid game on May 23rd when it happened. At first I couldn’t even piece together what I was actually doing when it happened, but I have slowly been able to recall. The crazy thing is I wasn’t even running when it happened and I didn’t fall or collide with anyone or anything like that. I had my left foot planted on the ground and the ball under my right foot… there was a guy behind me and I went to flick the ball behind me with my right foot to do a turn and suddenly POP- it felt like the guy behind me kicked me in the back of the ankle. I fell to the ground instantly and the pain was absolutely unbearable. My calf muscle was spasming nonstop and I could not move or feel my foot- the guy swore up and down he didn’t touch me but I was SURE he kicked me because that is exactly what it felt like. Nonetheless, after about 5 mins of crying in agony on the ground I got up and hopped off to the sidelines where I laid and iced my ankle area. At this point I still assumed the guy kicked me and that was why my ankle and calf muscle hurt, but I didn’t think much about it. The pain lessened and it just felt like a really bad muscle cramp in my calf and I couldn’t put weight on my leg at all. After the game I hobbled out to my car and went home to bed (again assuming nothing serious was wrong). I got up and went to work the next day, still unable to put weight on it- I hopped around and limped really bad. By lunch I knew something was seriously wrong. After googling my symptoms I was almost certain I had ruptured my Achilles, and I was shocked to say the least. I called the Fowler Kennedy Sport Medicine clinic as they are the best around here at treating this type of injury and they had me come in immediately as they also felt that it was an Achilles injury. I got right in to see an orthopedic surgeon and it took him no more than 2 minutes to make the diagnosis after I told him what happened and he looked at my leg and examined it. He knew with 100% certainty that I had fully ruptured my Achilles  My jaw dropped! He said that almost every patient that comes in with that injury says that they felt they were kicked or hit with a hockey stick etc – but that in fact that is just the pressure and sound of the tendon rupturing (gross, I know). He said he could feel the gap in my heel where the tendon had torn and he explained to me that there are 2 treatment options- Surgical and Non-Surgical and that he only ever recommends Non-Surgical to his patients due to recent case studies that he and his partners had done. Apparently the treatment plan for this injury is something that doctors around the world have not agreed upon for years. There is controversy over which treatment is better based on re-rupture rate, complications, return to activity etc. In the past, some doctors have favoured the Surgical route as it is thought that the re-rupture rate is lower and you can return to activity sooner. Newer studies (including the one done by my doctor), have proven that the conservative treatment option has the same outcome in terms of re-rupture etc and has less chance of complications and no surgery involved. Nonetheless, he explained that the case study done at Fowler Kennedy had determined that the conservative treatment is a much better option and therefore that is what he recommends for all of his patients. The protocol they use is called the “Accelerated Functional Rehabilitation Protocol” which has a focus on immobilization and early weight bearing as well as a structured physiotherapy regimen. From there he fitted me with an Aircast Boot with a heel lift and crutches. I am currently at 4.5 weeks and I am comfortably walking in the boot without crutches for short distances (I still use my crutches if I am doing far or if I have pain). The first couple of weeks I did have quite a bit of pain and bruising- I will upload some pictures to show the progress of the swelling and bruising. The bruising has mostly gone away now with a little bit still on the bottom of my foot- but it looks a LOT better! My doctor keeps telling me to put as much weight on it as possible as this helps the healing and helps to regain strength sooner. The first 2 weeks were very hard both emotionally and physically, but I can happily say the worst is behind me! Living in a 2 storey house with no bathroom on the main floor and our shower in the basement proved to be VERY difficult for the first 2 weeks, but I made it work. You get in to a routine once you figure out what works for you and how to make things easier on yourself. Showering on one leg was extremely difficult and hard on my knee and hip so I got a shower chair and that has made things much easier! •	Although it seems impossible, try your best to stay positive. I keep telling myself “it could be worse” and it really could be! At least it is my left leg so I can still drive etc. I work for an amazing employer who allowed me to work from home until I could get around easier, and lastly.. it is TEMPORARY! I have to keep reminding myself at least I will eventually heal, it won’t last forever! •	Keep it elevated as much as you possibly can- I made the mistake of not doing it as much as I should for the first couple weeks… rookie move! It got VERY swollen and very sore! •	Find a comfy way to sleep (yes, you have to sleep with it in). I found putting a pillow between my legs and sleeping on my side to be the most comfortable. •	Get a shower chair! •	DO YOUR PHYSIO EXERCISES! •	Take it easy the first couple weeks- I made the mistake of trying to keep my life the same and do everything I did before. Don’t do this! Although it is super depressing and you want to keep doing the things you normally do, you simply can’t! You need to take it easy for the first little while and allow yourself to heal! •	Accept help from people that offer! Don’t be too proud to accept help… People will want to help you! 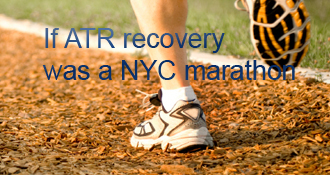 When you do, you can keep track of your recovery progress and see your information on the Marathon Tracker. Please change this post’s title to something more descriptive. Just leaving it as “Hello World” leads people to believe that you haven’t updated your first post! If you have any questions, don’t be afraid to ask! Hello! I tore mine on the 21st of May but went the surgical route. Will be interesting to read about your progress. What type of exercises do they have you doing in PT at this point? There is a definite mental difference between a rupture and having the surgery for bone spurs on purpose and planned. I can’t WAIT to get back out on the soccer field. But I know I’ll be in a lot less pain (hopefully no pain) since I’ve been playing with achilles pain for about 15 years. I’m hoping to be playing in a tournament in September - which will be the 7 month mark. I know I won’t be playing again at the 5 month mark but I might have the OK at month 6. Whether I’ll be strong enough to play then is another story - LOL! I second your thoughts about keep the foot elevated and do the PT. My doctor emphasized MANY times that avoiding swelling was very important and he explained why. Once I knew why I made it a point to do as I was told - LOL! And I already knew from my mom’s multiple surgeries and PT sessions how important it is to good recovery to do the PT homework you’re given. Good luck and welcome! Hi there! Hahah yeah it isnt exciting to be here but it’s certainly nice to have a place to read other people’s stories and discuss recovery Thanks for the comment! My doctor is Dr Kevin Willits and he is wonderful! I am indeed doing my physio at Fowler but I have been going to the Citi Plaza location as it is closer to my workplace and home. The staff there are fantastic also! Hope you’re doing well and have a speedy recovery!! Hi mmglover! I’d say welcome, but nobody really WANTS to be here! I too go to the Fowler clinic, and from your description, and knowing the specialties of the surgeon’s there, we have the same doctor. He and all of his staff are so awesome. Very caring, compassionate, kind and patient. My situation is a bit different, not a rupture, but a Haglund’s Deformity removal and Achilles repair, after a different ankle surgery last spring. So I’ve been going there for a couple years now. Are you doing your physio at Fowler as well? I went there for awhile before my first surgery. A really great facility. I go to U.H. now. - it’s free, post surgery. Good luck in your healing! mmglover’s AchillesBlog is proudly powered by WordPress and WPDesigner..